Scotland’s rich and vast history spans across many, many years and involves an ocean-full of conquerors. To capture it all in only a few words is impossible. But because it’s important to glean a little knowledge about Scotland’s past to better understand its present, and thereby gain a better grasp of our own history, I offer up some of Scotland's highlights, starting with its royalty. We've all heard about Robert the Bruce, who was Scotland's king from 1274 to 1329. [He was from Ayrshire by the way] His daughter, Marjory, married Walter the Steward and thus the House of Stuart began. The spelling morphed throughout the years from Steward to Stewart to Stuart, etc. Mary Queen of Scots was from this Stuart line. The Stuarts were Catholic, a religion that was adopted from the Romans by the Scottish Celts early on, around the 5th century. With the Catholic King holding absolute power over his kingdom, and the belief that the King was ordained by God to rule, imagine the corruption that ensued. If you had the freedom to do anything your heart desires, you'd like to think that you'd put the welfare of your kingdom first. Alas, it's human nature to be selfish, to take care of our own needs first, as well as those around us whom we love or favor. So yes, the church, and thus the crown, were very corrupt. The Stuarts ruled until the late 1400's when King Henry VIII's father (Henry VII) from the house of Tudor both married into royalty and his forces won a battle over the existing monarchy to end the War of the Roses. We all know what happened to Catholicism in the 1500's when Henry VIII was refused a divorce from his wife, Catherine of Aragon, by the pope. Henry VIII took the power of the church away from the pope and created the Church of England, over which he was ruler, not the pope. The reformation (or separation between the Catholics and Protestants) was also fueled by the Ninety-five Theses by Martin Luther in 1517, denouncing the corruption in the Catholic church. Oddly enough, a large part of the success of the Protestant movement was due to us Clarks (clerks). Martin Luther was able to reach the common masses by way of printed leaflets, which of course, were printed by clerks who knew how to run the presses. The struggle between the Catholics (Stuarts) and Protestants (Tudors) continued. With a country divided between the two main religions, and the king being the leader of that religion, each side would declare war back and forth until they pushed the other out of the monarchy. That’s what happened in 1688 when a Catholic King James was forced to abdicate his throne by the British Parliament because of his faith, and because he was vigorously persecuting Protestants. 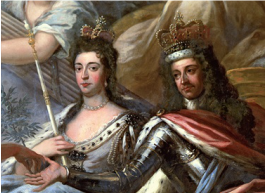 His Protestant daughter, Mary, who married her Protestant cousin, William, took over the monarchy jointly. Not everyone was happy about this and many people continued to support James’ return to the throne. Those who were loyal to King James were called Jacobites [Jacobus is the Latin name for James] Are you with me so far? Around 1715, the first group of Jacobites led a battle against the crown – which became known as the Jacobite risings. During this battle, the Jacobites were victorious, which gave them a false sense of superiority over the British Army. The crown knew that these skirmishes were facilitated mostly by the militaristic Scottish clans. Since clan members leased their lands from the clan chief, being called to fight was a traditional part of the system by which they held onto their land. Respect for their way of life involved dying for it when necessary. Although the British Army never felt the Jacobites were a real threat because the ousted King James's health was dwindling, nevertheless, as a means to disburse the clans and end the Jacobite battles, the Disarming Act was passed which took away all of the Scots' weapons. Of course, James' son, the Bonnie Prince Charlie, took over the Jacobite cause and in their final battle at Culloden in 1745, a great many clan members were executed and lands were given to any chiefs who remained loyal to the crown. Although a few chiefs were granted land ownership, most of the Scottish landowners at this time were British Aristocrats. As a clan member, you rented a small portion of land from the landowner. This system was called crofting and the small cottages in which the clan members lived were called croft cottages. Borrowing from American history, I think the roots of post-civil war sharecropping came from the crofting system in Scotland. The Clan system had been the effective means of government in the Highlands of Scotland from sometime before the year 1,000 AD. After the final Jacobite rising in 1745, the British monarchy attempted to destroy the clan system once and for all. In 1746, the Act of Proscription of Highland Garb was passed, banning all wearing of the kilt [and bagpipe playing, which was seen as an instrument of war] as a means to eradicate their deeply ingrained highland identity. It stated that "… no man or boy within that part of Great Britain called Scotland, other than such as shall be employed as Officers and soldiers in His Majesty's Forces, shall, wear or put on the clothes commonly called Highland Clothes ...[kilts]"
"The consternation and confusion were extreme. Little or no time was given for the removal of persons or property; the people striving to remove the sick and the helpless before the fire should reach them; next, struggling to save the most valuable of their effects. The cries of the women and children, the roaring of the affrighted cattle, hunted at the same time by the yelling dogs of the shepherds amid the smoke and fire, altogether presented a scene that completely baffles description — it required to be seen to be believed. A dense cloud of smoke enveloped the whole country by day, and even extended far out to sea. At night an awfully grand but terrific scene presented itself — all the houses in an extensive district in flames at once. I myself ascended a height about eleven o'clock in the evening, and counted two hundred and fifty blazing houses, many of the owners of which I personally knew, but whose present condition — whether in or out of the flames — I could not tell. The conflagration lasted six days, till the whole of the dwellings were reduced to ashes or smoking ruins. During one of these days a boat actually lost her way in the dense smoke as she approached the shore, but at night was enabled to reach a landing-place by the lurid light of the flames." Because of the mass evictions in the late 18th and early 19th century, the Scottish government passed the Crofting Act in 1886 which protected crofters from being unfairly removed from their land, guaranteed fair rents, allowed compensation claims for improvements done to the land, and the like. Unfortunately, this law was passed over a hundred years too late. During the Clearances, land owners did with their tenants what they very well pleased. After all, it was their land. With a great influx of able bodied workers, the growing number of factories and coal mines located near larger towns and cities in the Lowlands relished in a huge work pool from which they could now draw. Displaced farmers and tradesmen moving down from the Highlands were quick to learn new industrial skills, such as fishing, weaving, mining, and shipbuilding. This was the time of Scotland’s Industrial Revolution which suddenly propelled everyone into a modern, capitalist world, brimming with scientific and technological breakthroughs. Based upon the efficient exploitation of Scotland’s raw materials and ready labor, new scientific theories developed by the Enlightenment thinkers were quickly transformed into practical, money-making applications. As well, the ensuing advances in the farm industry reduced the number of family members needed for farming as traditional manual work was completed by machines. Children of farmers also left their rural homes to seek out employment in various industries in the towns and cities. Young boys were enticed to work in factories as “apprentices” where in addition to learning a new skill, they were given room and board instead of wages. As one might imagine, this system was rife with child abuse. In areas such as Edinburgh, extended families packed into tiny apartments, much like the overcrowded tenements in New York City during that time. As a result, unemployment skyrocketed. Before 1750, Scotland was predominantly a rural, agricultural economy whose rate of change grew at a snail’s pace. Religion, tradition and social customs remained unchallenged for centuries. In a window of less than half a century, however, the Highlands became one of the most sparsely populated areas in Europe [except for the sheep], and poor living conditions from overcrowding increasingly plagued the densely populated coastal towns and lowland areas. Over the next one hundred years, Scotland’s Industrial revolution mushroomed, and overcrowding in coastal areas became the norm. To make matters worse, a succession of bad harvests and famine followed. In the latter half of the 19th century is when our history separates from Scotland and begins in America. Our progenitor, Billy Clark, wanted to leave the overcrowding, famine, and inability to shed the prison of tenancy. We know it was 1870 when Billy left Scotland, bound for America. But beyond that, do we know who he was, where exactly he lived, and who were his ancestors? For me, it’s not enough to just know Scotland’s history – I want to know how and where we fit in to Scotland’s history. So let’s stop here, travel back a couple of centuries, and take a look at Scotland through the eyes of our ancestors. We’re all eager to know exactly from which Scottish clan we came [me included]. 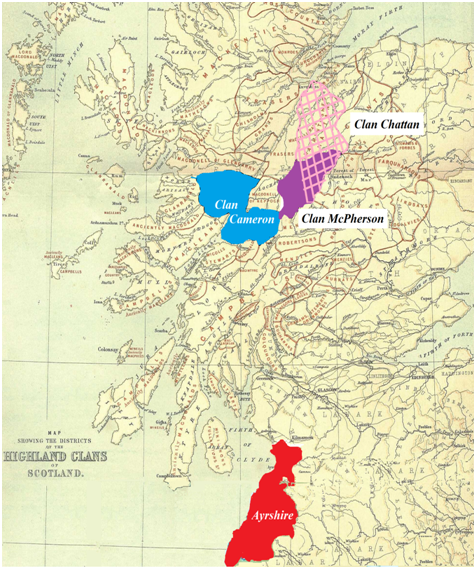 And after researching many solid sources on the origins of the Clark name, I found that we are supposed to have originated in the highland county of Inverness-shire, under the clans of Cameron and McPherson, with a few Clark's spread throughout Clan Chattan. Although the Clark's didn’t head their own clan, it was very common for families to be protected by, and thereby subject to, another closely related clan. Such was the case where historically, the Clark’s lived with either the Cameron’s, McPherson’s or Chattan’s, all three residing in the highland county of Inverness-shire. Now it’s such a romantic notion to think that our ancestors, living in their centuries-old thatched-roof homes in the highlands, caring for their few cows, perhaps a hog, and their tiny gardens, fighting when needed in the Jacobite risings, were forced to leave their ancestral lands during the Highland Clearances. They must’ve walked for days and days, with only a few belongings on their backs, only to end up in the lowlands. With just a few tools and by the sweat of their brow, they scratched out a living by farming whatever ground they could find. It's out of these stories that great movies are made. However, I’ve found evidence to prove that’s just not the case, at least not with our family. Our Clark's were living in Ayr and its surrounding towns in the lowlands, about 150 miles away from Inverness-shire. This was way back in the early 1600’s, at least a hundred years before the Highland Clearances began. Of course there are many explanations as to why our Clark's lived far away from all of the other Clark's. One possible reason is that our line may have actually begun with another name. Since many surnames originated from occupations, the name Clerk [or Clarke or Clark] stuck, and so this other-named clerk in Ayr in the 1600’s could’ve simply passed on the occupational surname to his son. It could also be possible that a Highland Clark may have fallen in love with a member of a Lowland clan, and followed her back home. [My romantic ideology prefers the latter explanation] At this point, I simply don’t know the answer. However, thanks to Ancestry.com, and even more so to ScotlandsPeople.gov.uk, we do know that our Clark line can be traced back to the early 1600’s, and each generation lived in the coastal Lowlands, in the county of Ayrshire.